Summer is coming what means that you should start thinking in your home renovation, so why don’t start with the lighting design? Today we have arranged a unique selection of the top 10 suspension lamps for your living room decor, that will certainly make a statement in your place. Ella suspension is a design masterpiece; with its sober lines it has surpassed the test of time. A style icon of the ﬁfties and sixties suitable for any living room. This singular luminaire captures your attention letting you feel the acoustics of the bright Hendrix guitar and reminding us the high fidelity audio reproductions, we present you Hendrix ceiling lamp. Galliano suspension lamp. An extremely balanced design which gets even more beautiful when you see light being casted thought its pipes. Up to 5 tubes, it produces a unique and gorgeous lighting effect. This magnificent Hanna pendant lamp is elegantly composed by five arms and three lampshades made in aluminum by artisans who apply delicately an ancient technique called hand metal spinning. Inspired by a ﬂower bouquet we designed Madeleine. Light, gentle and elegant this Madeleine suspension ﬁxture adds a French touch to any cool commercial establishment. Diana Suspension Industrial Lamp. This versatile light is either functional by adjusting its extendable arm into different positions. Its structure is made out of brass and the lampshade in aluminum. A unique retro touch. Stanley Suspension Lamp is a versatile piece which gives a sophisticated and classy ambiance to any setting. A style icon of the fifties and sixties. This vintage lamp’s structure is handmade in brass and the lampshades in aluminum with the possibility of having 1 to 5 moveable arms. This unique suspension version of the mid-century design has come to change the way we decorate our dining and living rooms, we present you Amy Suspension Lamp. 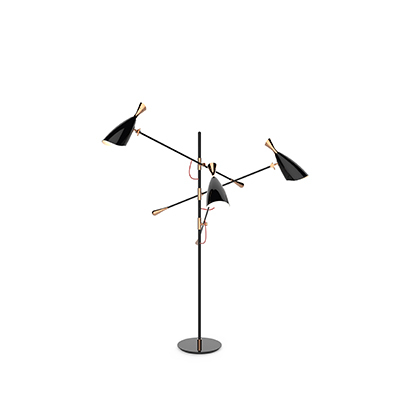 Sinatra Suspension Lamp. If you ever ﬁnd yourself listening to “New York, New York” by Frank Sinatra while drinking a cocktail, this piece will be there. . A sculptural and versatile creation which is suitable for the most demanding setting. Turner Suspension Lamp is inspired by Tina Turner’s dance moves and inspired the rotating arcs for you to create your favorite composition. It is a classy choice with a mid century design.